Marlboro man wants us all to quit smoking. Is he crazy? When the maker of Marlboro cigarettes promises to spend $1 billion to get the world to stop smoking, it’s natural to take its altruism with a healthy pinch of salt. Or an unhealthy pinch of tobacco, whatever works. Indeed, one could ask why Philip Morris International Inc. wants to make a down payment on its own funeral by backing the Foundation for a Smoke-Free World? Does it have a death wish? The answer, of course, is no. Big Tobacco is simply reading the smoke signals about the industry’s future, and it wants to make sure it sticks around. China is a particular worry, though less so for the minimally present international giants (even if they may dream of future expansion there). While the Chinese smoke 43% of the world’s cigarettes, the market has waned, slowing down global cigarette growth by value in 2016, according to data from Euromonitor International. More pressing for Big Tobacco is the US Food and Drug Administration’s bombshell announcement in July about cutting nicotine in cigarettes. Investors didn’t take it well. Small wonder that companies are desperately seeking alternatives, much like the chastened European car industry is betting big on electric vehicles after all the diesel emission scandals. The problem is, there’s no Elon Musk yet to point the way to a cleaner-lunged future. The e-cigarette and its ilk will spread incredibly quickly between now and 2021, according to Euromonitor, but they’ll still be dwarfed by traditional tobacco products. More worrying for the industry is how profitable the new products are when compared to traditional smokes. But this isn’t a very useful guide to real profit margins. Most of the retail price for a pack of cigarettes is made up of tax, while for the new products it’s pretty insignificant. If you strip out tax (which you should do because it’s essentially paid for by the smoker), you get to what some call the net sales price, which includes the cut taken by retailers and the cost of the goods sold. 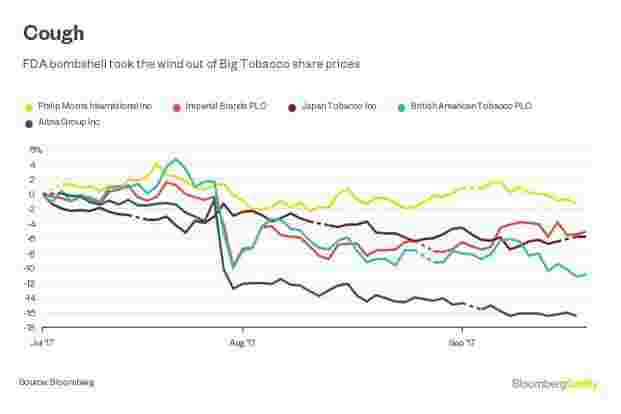 Whatever’s left is a more useful measure of the tobacco companies’ margin. BAT doesn’t give all the numbers used to generate its slides, so we can’t be explicit about what those margins are, based on the net sales price. But we do see a much more mixed picture for the new products than the slides suggest. While glo, the Japanese heated tobacco product, has a higher margin on this basis than cigarettes, the Polish vaping product has a much smaller advantage. The margin on the German vaping product looks significantly lower than for cigarettes. For now, tobacco companies have been able to offset tax increases and the decline in cigarette volumes with price hikes -- which are barely noticeable because they’re masked by the taxes. Yet the lower taxes on electronic products make it harder for companies to jack up their prices without consumers noticing. One reason for industry hope is that the vamping market is still fragmented and far less regulated than cigarettes. Big Tobacco is expecting to seize more market share and Philip Morris, BAT and the rest will put the squeeze on the cut taken by retailers, as they have with smokes.